One morning, suddenly one thought came to my mind that, why some people are happy with nothing and some are unhappy even if they have everything? What is the cause of unhappiness? What is Fear? How to live a better life? Why people are going into depression? Questions like WHY? WHAT? HOW? Clustered around me. By continuous introspecting with myself, finally I got the answer and solution to the above problems which I thought I should share with you all. This might help you. Follow your dreams : Never think you are nothing. Never think you are everything. But always think you are something and you can achieve anything. Possibilities are endless, you can become anything, you can do anything, you can change this world. Make a list of everything you have ever dreamed of doing and then make it happen. Dreams are not achieved by sitting around and waiting. They are achieved by getting up and working for them. Take action towards your goal, create opportunities and turn your dreams into reality. If you really want something you will find a way to achieve it. Life is like a cricket match, when you see the ball of opportunity coming towards you, just go ahead and hit the six. Grab the opportunity, but don’t run away from the pitch. Spend time thinking about your strengths and you will find yourself happier and also more confident. If there is a doubt on something, then remember, it’s always better to regret something after doing it rather than regretting without doing it. Keep child inside you Alive: When we were small, we dream of flying in the air, piercing through the clouds in open sky and we used to believe in it, but the dream ended the very moment you grew up. By the time we grow up we believed that, we cannot achieve our dreams. In this whole world anybody who has been successful has done so, by keeping that little kid inside them alive and not by killing him. That kid who is not afraid of dreaming, who learns to walk by falling again and again, who believe that he can do anything, who not only flies in his dreams but in reality as well. So be ready to become a child once again, because success is not a man’s task, rather it is a child’s play. Determine your goal/purpose in life : You cannot reach anywhere, if you don’t know your destination. The first step is to find out what you want from life. Work towards that and surely the fruits will be yours. Divide your long term goal into small short term goals, give reward to yourself once the smallest goal is achieved. This will motivate you to work harder towards that. Try to live life, not just survive. The greatest risk in life is not taking risk in the life and then you become biggest risk in your life. Overcome FEAR : Fear is the prison created by our own mind. Why to remain behind the bar without any guilt? Give your 100%, break the bar of prison, go and face the situation. The only way to overcome fear is to face it. If you start facing challenges, it will become too small, but when you try to run away from the challenges, problems will grow. The biggest mistake you could ever make is to not do something you fear you will make a mistake. Don’t live for others : Don’t choose your path in life based on expectations set by others. Stop trying you please everyone. Listen to your heart and soul. Choose your own path. Give 100% to reach to your destination and one day you will be on the top of the world. Best advice which can be given… “Ignore Advises”. Life is too short to be distracted by the opinions of others. Live the way you want. Trust yourself : If you are still searching for the person that can change your life then just look in the mirror. You are the writer, director,producer and creator of your own life. You just have to believe in yourself. Don’t judge yourself,accept the way you are. Be you. Love yourself. Have the courage to be yourself. Life is too short to be shy. Forget what others think and live your life..! Do what you want, because life is what you make it. The happiest people don’t have the best of everything, they just make the best of everything. Focus on your inner and outer beauty to see the same in others. Always be true to yourself. Don’t be afraid of the power within yourself. You will be amazed of what you can achieve. Change your physiology : Mind and body both are connected. Whenever you feel depressed, just get up, change your posture, bring a smile on your face, you will instantly feel good and happy. Smile is a signature of god on your face, do not allow it to be washed away by your tears and erased by your anger. Don’t be greedy in giving Smile to others. Smile is the best ornament one can wear and it is the only curve which can set everything straight. Your posture and body language not only shapes how the people see you, but it also shapes how you feel about yourself. Feel that you are being loved, feel that you are happy, feel that everything you want is already there with you. Positive Feeling will definitely change your frequency and you will start attracting what you felt and imagined. Surround yourself with the type of people you want to be : If you constantly spend time with negative people, you will become negative as well. If you spend time around the people with no ambition, you will find your own dreams slipping away as well. On the other hand surround yourself with awesome people who want the same things you want in life that will set you up for success. Live in the present: Yesterday is a history, Tomorrow is a mystery but today is a gift, that is why it is called the “Present”. Plan for the future but don’t worry about that, think about past but don’t get lost in it. Live in the present. Each day is the fresh start with options just waiting to be explored. Celebrate the present moment. Wake up the child within you who doesn’t care worry about future, forgets the unpleasant things immediately and completely enjoys the present moment. Share the happiness : “Be a go giver, not just a go getter”.Try to convert dates of calendar into memorable moments by helping others, by spreading happiness, by making other people smile. Be the cause of happiness in some others life. Happiness is always a choice. Just be aware that, unhappiness only comes from your own thoughts. Don’t ever forget the only purpose of life,you have been sent here to make the world more beautiful. Love truly, Laugh uncontrollably and never regret. Just 1 word as a response ‘THANKS’.. Very inspiring and infecting ( for good of course). Thanks a lot for my mind got transformed and improved just while I was reading the article and not finished. Thank you Purvi for such an encouraging article. great aspect of life, everybody has to follow it. Its really a beautiful article. Its really a blessings for us to get such motivation in our tough times. May gods blessings be always there with you. Very inspiring article….written very beautifully! Purvi… This is all what you are in real life…… be the best and spread happiness…. There are three important Upanishads, Kathopanishad, Mandookya and Aithareya Upanishads which are the base for what you have narrated. Recommended for you. Try to learn. Albest!!!!!!!!!!!!!!! Thank you so much for sharing some thing totally different. 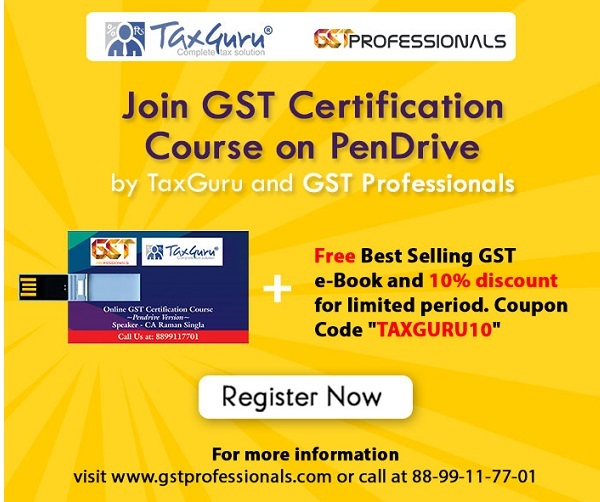 I am a frequent browser of all the items, which come in Taxguru.in web pages. All along, I was under the impression that CAs discuss only matters relating to taxation. But, here is a total exception, sharing something most valuable and important to every human being. I wish all the CAs, who contribute to this discussion forum, share some thing different like this. The message is really inspiring and made me feel never regret for anything and be happy and set the goal for life and play the master stroke. The message is written very aptly and encouraging. The lines are very much inspiring. May God bless you with all good thoughts, knowledge and happiness, so that, I am sure, you can share with all and make all happy.